One drop INW Natural Mint per 10ml-15ml (10 if you a really heavy menthol vaper). This is minty V2, slight changes to the cookie but adds a different flavor. 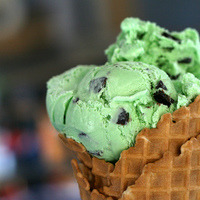 I've heard a andes/thin mint flavor the first week from a lot of people before it moves to ice cream with a cookie cone around the 1 week mark. Derived from Minty Down Under by Rageisalotofwork. This recipe is the property of Rageisalotofwork and released under the CC Attribution-NonCommercial-Sharealike 4.0 license. You may not copy, derive or commercialize this recipe without following the terms of this license or the explicit permission of the creator. i HATE chocolate vapes, HATE.... Is not a strong enough word. I do NOT HATE this. Is Good, mix it. Amazing recipe. Tastes like a creamy thin mint. Simply spot on.